Theft shouldn’t at the forefront of your mind when trying to sell your home. But, would you ever let a total stranger walk through your home when you weren’t there? I’ll bet the answer to that is a resounding NO! How about taking out an ad showing the exact times you won’t be home? No? Well, surprisingly, open houses can be target for these exact reasons. So taking the following steps can help prevent any unwanted attention and minimize the opportunity for theft. Work with a reputable agent that uses sign in sheets for everyone who will enter your home. If you have a multi-level home, request that your agent bring an assistant. They are not only an additional pair of eyes, but they can also prove invaluable for answering questions or keeping the conversation going with potential buyers. 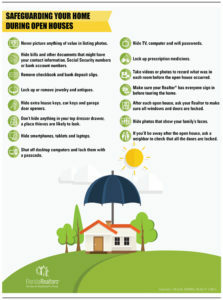 Remove any heirlooms, valuables or medications when your agent takes pictures of your home. Your listing photos will most likely be a part of the ad for the open house. Remove any bills or other documents that may have your contact information, social security numbers or bank account numbers. This includes checkbooks and bank deposit slips. Remove extra house keys, car keys, and garage door openers. If possible, remove smartphones, tablets, and laptops. Make sure that gaming consoles and headsets / headphones are put away. Ask your realtor to double check all windows and doors are securely locked after each open house. Safeguarding your home will be different for each seller, but this list is a good place to start. Common sense also goes a long way. Most likely, no one will walk out with your big screen plasma tv. But it never hurts to take a few precautions to maintain your own feeling of security. And, of course, if you have any questions, never hesitate to contact us! We are happy to help in any way we can.